Born and raised in Napoli, he moved to Milan where he graduated at the Istituto Europeo di Design, He began his career in Fashion, working in the Fashion Show organization and Event planning field. He built his background while for prestigious fashion and lifestyle magazines, working in set design and table arrangement. Being a huge opera lover Enzo Miccio, together with his team, he plans and produces special events and luxury weddings not only in Italy but also abroad. He takes care of every single detail, working on each aspect of the event as on the premiere of a grand opera. Each event is unique and focuses on the maximum customization of every aspect: from the location choice to the floral decorations, from the furnishings to the table design, from the soundtrack to the light design and the grand finale which, in case of a wedding ceremony for instance, comprises an outstanding wedding cake with a scenic appearance able to surprise and thrill any guest. 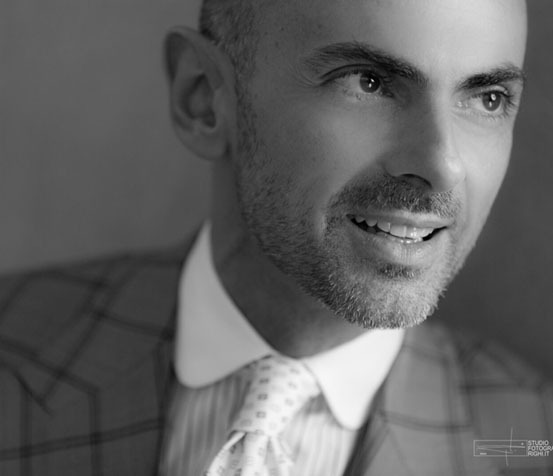 It’s due to Enzo Miccio that the role of Wedding and Event Planner has widespread and consolidated in our country. Being highly-requested, in 2009, the Enzo Miccio Academy has been opened. Today, it provides not only Wedding and Events courses, but also Fashion and Image courses. The first ones comprise the Weddings and Event planner course; Image Consulting and Bridal make-up; Mise en place and etiquette; Backdrop of an event: fittings and decorations, Wedding personal coach, Web self Marketing. The latter comprise: Image consultant and personal shopper; Make up artist; Trend-spotting: how to identify trends, web self-marketing. Since 2005, Enzo conducts the TV series “Wedding Planner” aired on air on Real Time (free DTT channel 31 and channel 126 on Sky), a program that tells his story as an event designer, always creative and challenge-driven. Also on Real Time, he presents “Ma Come ti vesti? !” show, starting from 2008, where he talks about Fashion, Style, Etiquette, giving many valuable advices in order to avoid outfit mistakes on any occasion. In addition, starting from 2011, he started to present a third show in TV – “Shopping Night”. It is a spectacular and entertaining game about Style and Fashion, where the competitors have access to an entire store for one night, in which they must find suitable clothes for any occasion decided by the judges. Finally, “L’eleganza del Maschio”, is the last television experience on Real Time starring Enzo Miccio as the ultimate expert of a man’s good taste and elegance. In addition to his event planning company, his Academy and TV career, Enzo Miccio is the author of the following publications: Il Matrimonio che vorrei (Mondadori 2008); Ma come ti vesti? (Rizzoli 2010); Matrimonio da Favola (Rizzoli 2011); Cercando Grace (Rizzoli 2012); L’eleganza del Maschio (Rizzoli 2013).